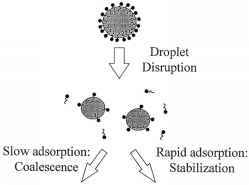 FIGURE 6.2 The size of the droplets produced during homogenization depends on the balance between the time for an emulsifier to adsorb to the surface of a droplet (t adsorb) and the time between droplet-droplet collisions (t collision). tive forces generated within the homogenizer, which tend to pull them apart (Walstra 1983, 1993b). Here, y is the interfacial tension between oil and water, and d is the droplet diameter. To deform and disrupt a droplet during homogenization, it is necessary to apply an external force which is significantly larger than the interfacial force (Walstra 1983, 1996b). Equation 6.1 indicates that the pressure required to disrupt a droplet grows as the interfacial tension increases or as the droplet size decreases. It also indicates that intense pressures must be generated within a homogenizer in order to overcome the interfacial forces holding the emulsion droplets together. For example, the Laplace pressure of a 1-|im droplet with an interfacial tension of 0.01 N m-1 is about 40 kPa, which corresponds to a pressure gradient of APlId ~ 40 x 109 Pa m-1 across the droplet. 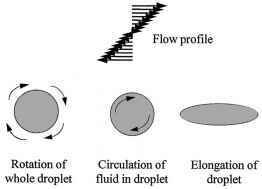 FIGURE 6.3 In the presence of a simple shear flow, droplets may rotate and become elongated. In addition, the fluid inside a droplet may circulate around the center of the droplet. (Stone 1994, Karbstein and Schubert 1995). The susceptibility of emulsion droplets to disruption is conveniently characterized by the Weber number (We), which is the ratio of the disruptive forces to the interfacial forces (Walstra 1983). 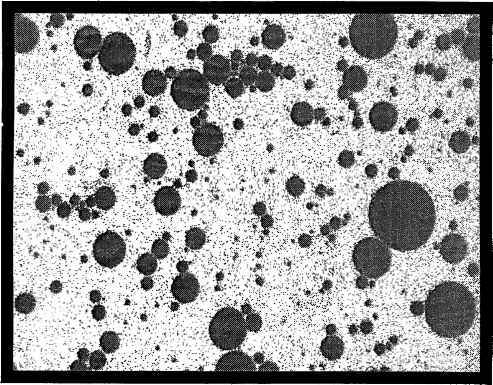 Droplets are disrupted when the Weber number exceeds some critical value (around unity), which depends on the physical characteristics of the oil and aqueous phases. The flow profile of an emulsion within a homogenizer is usually extremely complex and is therefore difficult to model mathematically (Phipps 1985). For this reason, it is not easy to accurately calculate the disruptive forces that a droplet experiences during homogeniza-tion. Nevertheless, it is possible to gain much insight into the factors which affect the homog-enization process by considering droplet disruption under simpler flow conditions which approximate those that occur in actual homogenizers (i.e., laminar, turbulent, or cavitational flow conditions) (Gopal 1968; Walstra 1983, 1993b; Williams et al. 1997). Laminar Flow Conditions. This type of flow profile is predominant at low flow rates, where the fluid moves in a regular and well-defined pattern (Curle and Davies 1968, Walstra 1993b). Different types of laminar flow profile are possible, depending on the direction and velocity at which different regions within the fluid move relative to one another (e.g., parallel, simple shear, rotational, and hyperbolic flow) (Gopal 1968). For convenience, only the disruption of droplets under simple shear flow conditions is considered here. In the presence of a simple shear field, a droplet experiences a combination of normal and tangential stresses (Loncin and Merson 1979). These stresses cause the droplet to rotate and become elongated, as well as causing the liquid within the droplet to circulate (Figure 6.3). At sufficiently high shear rates, the droplet becomes so elongated that it is broken up into a number of smaller droplets (Stone 1994, Williams et al. 1997). The manner in which the droplets break up depends on the ratio of the viscosities of the droplet and continuous phase (. Experiments in which droplets were photographed under different flow conditions have shown that at low values of the droplets break up at their edges, at intermediate values they break up near their middle, and at high values they may not break up at all, because there is insufficient time for the droplets to deform during the application of the disruptive forces (Gopal 1968, Williams et al. 1997). * The reason that a factor of 4 appears in Equation 6.3, whereas a factor of 2 appears in Equation 6.2, is because only half of the applied shear force goes to deforming the droplet; the remainder causes the droplet to rotate and is therefore not responsible for droplet disruption.